The highest and finest region of the Arabian Peninsula's biggest mountains. Magnificent and varied trekking. The Hajar Mountains form the central and south-eastern reaches of that 600km rocky spine which climbs out of the sea in the Musandam Peninsula and marches, parallel to the Gulf of Oman, until it stutters out south of Sur far to the south-east. These mountains snake along the country's eastern seaboard; on the eastern (seaward) side, plains hoard much of Oman's population. To the west lie the vast Arabian deserts, with the range’s slopes and irrigated valleys, and the nearby plains, harboring ancient villages and towns. This is the highest mountain range on the Arabian Peninsula, with views to boot. It is riven by canyons and wadis; soaring mountains and tremendous cliffs are the order here. Its uplands include rough grasslands, scrub and a lot of bare rock. 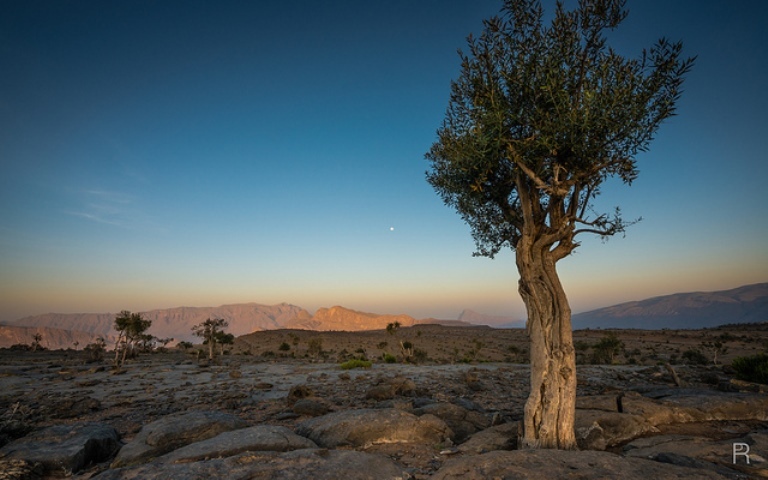 Oman is home to a huge range of plant and animal life, which is somehow counterintuitive considering how arid the country is, and is testament to its green credentials. That said, you will be lucky to see many mammals other than wild donkeys; and birds can be elusive even though Oman sits on major migratory routes and is a bit of birdwatching heaven. The Hajar also have a rich culture and history: Oman sat on great trade routes, on sea and land, and these brought several periods of wealth. Throughout their length, the Hajar display a wealth of ancient villages, many now abandoned, and the sophisticated and irrigation systems which supported their often luxuriant valley-bottom and hillside fields; unlikely forts; and forgotten routes over remote passes. Because of all this history, there are many old paths, pack trails and livestock paths, often superbly made and dramatically sited. There is a plethora of great walks here, from short explorations to multi-dayers. Note that few paths are marked (and indeed often barely exist, often being on faint animal tracks), and, given the contorted nature of the landscape, it is easy to get lost, so walk with care: a guide is a good idea for long/remoter walks. The Western Hajar Mountains are so big, there are many sub-ranges and standalone areas within it. Oman’s highest mountains, at the centre of the Western Hajar, boast a superb array of landscapes, from the rough, tough broken limestone of its highlands, to the huge gorges crashing out of the range and the tremendous chasms falling off to the sides. 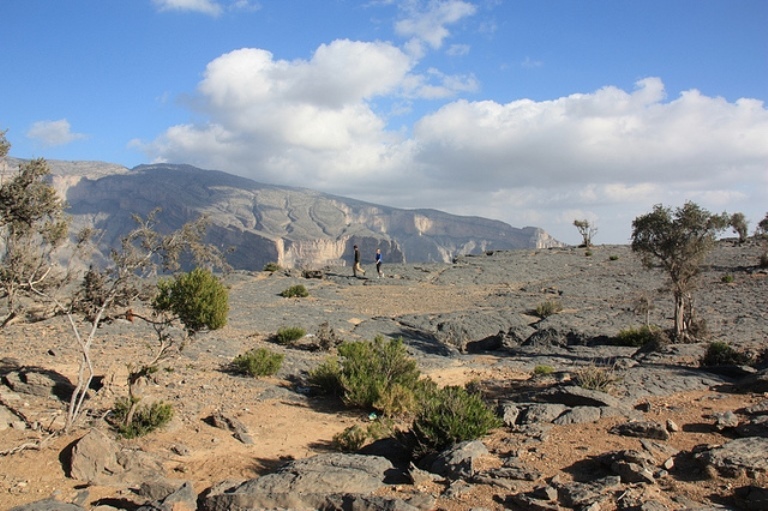 This is Oman’s premier walking/trekking area, and contains a huge variety of walks. See our Jebel Ahdar page for much more. In the far west is the Jebel Shams area. Wadi Nakhur, also known as Oman’s Grand Canyon, is a huge and truly spectacular hole with vast cliffs dropping to its deep and, in its lower reaches, lush bottom. There are two waymarked, connected walks along its western rim to a maximum altitude of 1,900m. 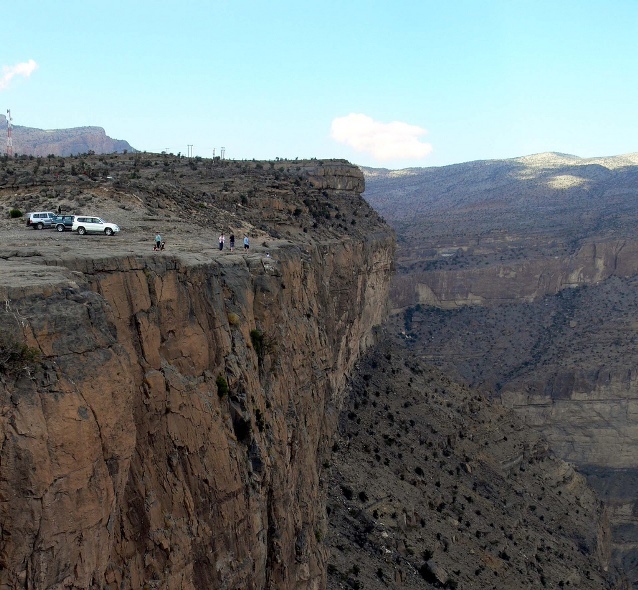 The Rim Walk and the Balcony Walk, one of Oman’s best-known walks. Peak baggers should try Oman's highest mountain, Jebel Shams. Mid-Akhdar - see our Jebel Ahdar page for several fabulous walks in the middle of the range. The East - See our Jebel Ahdar page for more details. The Sayq Plateau is a peculiar high areas of rough hills at the eastern end of the range. The best walk here is between the villages of its south-eastern rim. Wadi Muaydin, an endlessly deep gorge, makes for fascinating exploration, as it slices its way southward from the edge of the Sayq Plateau. The huge Ghubra Bowl in Upper Wadi Mistall, to the north-east, has superb scenery and walking below the Sayq Plateau. Northern Foothills - See our Jebel Ahdar page for a selection of fine walks here. This can be tough walking in remote mountains with uncertain and often very hot weather. Come fully prepared. Have a look at TripAdvisor – there are tens of millions of reviews, so you may get good, current views on guides, places to hike and places to stay in Oman. Please help us by recommending your best walks, making suggestions, and sending photos! Thank you!